In the coming world of ICD-10, we’ll actually have—perhaps unbelievably—several ICD-10 codes in play for a case such as this one: W59.21XA, Bitten by turtle, initial encounter; W22.02, Walked into lamppost; Y92.024, Driveway of mobile home as the place of occurrence of the external cause; S02.2, Fracture of nasal bones; and G44.311, Acute posttraumatic headache intractable. The upcoming transition to ICD-10 on October 1, 2013, and the new electronic transactions standards for claims that go into effect on January 1, 2012, grew out of HIPAA. The law included provisions for the standardization of healthcare information, designating standards for transactions of medical information, including claims, eligibility, and referral authorizations. On January 1, 2012, the electronic transaction standard for claims submission will change from version 4010 to 5010. On an even larger scope, the 2013 conversion from ICD-9 codes to ICD-10 codes will dramatically change the revenue cycle for all healthcare institutions. Together, version 5010 and the ICD-10 code adoptions are the solution to standardized healthcare information for HIPAA compliance. ICD-9 codes have been around for approximately 30 years, and version 4010 has been the electronic transmission standard since the inception of electronic claims. The ICD-9 codes are used in medical billing and are the diagnosis codes for a patient’s medical conditions. A typical code might be 782.3 for edema or 486 for pneumonia. ICD-9 is the official system used to assign codes to diagnosis procedures for patient treatment in all settings. The ICD-9 codes are three to five alphanumeric characters, and there are approximately 18,000 such codes in the system. The current ICD-9 codes present some challenges. Some use outdated and obsolete terminology, lack detail, are not applicable to today's practice of medicine, and do not fit in with the HIPAA provisions. ICD-10 will be introduced with some significant differences from ICD-9 codes. There are two types of ICD-10 codes: ICD-10-CM and ICD-10-PCS. ICD-10-CM is the diagnosis classification developed by the Centers for Disease Control and Prevention for use in all U.S. healthcare treatment settings. These codes have three to seven alphanumerics and are very similar to the ICD-9 codes. There are approximately 68,000 of these codes. ICD-10-PCS is a procedure classification system developed by the Centers for Medicare & Medicaid Services (CMS) for only U.S. inpatient hospital settings. These codes use seven alphanumeric characters, and there are approximately 72,000 of these codes. Under ICD-9 when you see a given CPT code, you can usually identify the appropriate diagnostic code from a short list of candidates. With ICD-10 codes, this number of diagnostic codes increases by nearly tenfold. • codes for postoperative complications have been expanded and a distinction made between intraoperative complications and postprocedural disorders. • V04.09, Pedestrian on snow skis injured in collision with heavy transport vehicle or bus in nontraffic accident. Radiologists depend on the referring physician to give the order for and the reason behind an exam. They are also dependent on the physician for pertinent information related to an ordered exam. With ICD-10 codes, the amount of information required from the referring physician increases dramatically. Imaging facilities will have to acquire a much greater history for a patient when scheduling an exam for the purposes of precertification, dictation, and subsequent billing of a procedure. ICD-10-PCS codes for inpatients must be matched correctly with the CPT code for the procedure. For example, suppose a patient fell in a chicken coop, suffered significant head trauma, and was admitted to the hospital. The patient was then sent for an MRI of the brain. Under the current system, the billing department would use CPT code 70551 for an MRI of the brain without contrast. The matching ICD-10-PCS code is B030ZZZ, Magnetic Resonance Imaging (MRI) of Brain. It would also be necessary to match up codes for the diagnosis in the ICD-10-CM code list, including S06.0X1A, Concussion with loss of consciousness of 30 minutes or less, initial encounter, and Y92.72, Chicken coop as the place of occurrence of the external cause. Failure to include the appropriate codes and detailed reporting will delay reimbursement and possibly cause a loss of revenue. The challenge for radiology providers will be preventing referring physician offices from inhibiting their work because the referrers are not ready for the new codes and reporting requirements. Imaging facility managers will need to work closely with referring physicians and help them prepare for the ICD-10 introduction on which radiology’s billing depends. • Become familiar with the CMS website for ICD-10 (www.cms.gov/ICD10). • Perform a SWOT (strengths, weaknesses, opportunities, threats) analysis in your department on the basis of the current state of employees, IT, and environment. • Determine your department’s future statement (what you intend to achieve) for ICD-10 implementation. • Form a strategic business plan detailing the strategy to move to the future statement. • Gain buy-in from management. • Test, measure for successes and failures, and always improve. • All personnel, systems, and functions in the radiology revenue cycle process should be involved in this process, from patient registration to delivering the radiology report to subsequent billing of the procedure. • Identify challenges, including an understanding of the timeline associated with and implementation of the new codes, communication throughout your departments, IT, educating everyone in the department, and expected dysfunctions inherent to your institution. • Develop education/training plans for all employees. • Send radiology schedulers to medical coding classes or “boot camps” and require them to get certified in medical coding. It would be beneficial for your schedulers to know what information is needed when they schedule appointments and obtain detailed information at the first intake level. • Enable your radiologists to go through training for dictation specifications. Though October 1, 2013, may seem far away now, it will be here sooner than you think. Now is the time to prepare for potential coding challenges related to the changes, which will have huge implications on the radiology revenue cycle. 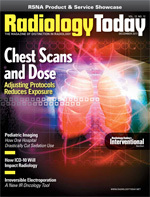 There is much to lose in the way of revenue if a radiology department is not ready for the new codes. If you take the time now to properly prepare and train your employees for the changes, then you will be able to take advantage of the benefits of these new codes and not interrupt your business and the financial stream that supplies your institution. — Ronald V. Bucci, PhD, is administrative director of radiology at Akron Children’s Hospital in Ohio. • tracking public health and risk.